Media and Publication Company, Minstrel's Alley has just published The Cuban Quartet, a new action adventure novel by author Gordon Basichis. “With Cuba so much in the news today, we figured this new work of fiction would draw a lot of interest," said M.J. Hammond. “The story is based on a speculative event told to Gordon Basichis by an older friend, a former CIA agent, who was based in Cuba." Minstrel’s Alley, an independent publishing and media group, has published author Gordon Basichis’ latest novel, “The Cuban Quartet," an international romantic mystery, seeded on the rumors and legends surrounding missing mob money when Castro marched into Havana. The book is available in both trade paper back and eBook formats. “We have great hopes for “The Cuban Quartet,” said Minstrel’s Alley Publisher and President, M.J. Hammond. “It is wonderful action adventure tale, filled with romance and international locations. This is a love story that is based on speculative incidents that may have occurred when Cuba fell to Fidel Castro in 1959. The main narrative occurs some thirty years later when the two protagonists must track down four rogue government agents who vanished like ghosts with millions in gold shortly after the Cuban Revolution. 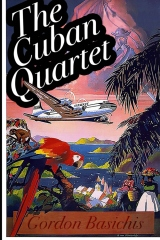 Hammond pointed out that “The Cuban Quartet” is rich in mood and texture and at times reads like a travelogue of some of the more exotic cities in the world. She noted that the novel was literally years in the making. Hammond noted that Gordon Basichis is also the author of the media group’s bestselling release, “Beautiful Bad Girl, the Vicki Morgan Story,” a biographical novel that chronicles the tempestuous love affair between department store scion Alfred Bloomingdale and his long time mistress that made international headlines while defining exotic sexual mores among the rich and famous, during the eighties. “Gordon is also author of several other books,” said Hammond. “They include “The Guys Who Spied for China”, “The Constant Travellers,” and “The Blood Orange,” a modern take in the great Los Angeles film noir romantic mystery tradition. “We are thrilled to now add 'The Cuban Quartet' to our list,” said Hammond.